The San Diego Police Department (SDPD) has re-launched a massive eradication effort against dispensaries, collective cultivation efforts, and medical marijuana patients. Those using cannabis with a doctor’s recommendation are not safe from the very law enforcement that’s supposed to protect them. Since taking office a few months ago, Interim Mayor Todd Gloria has made eradication one of his top priorities. Gloria shifted the city’s course from protecting patients to eradicating safe access. The new Mayor with direction from District Attorney Bonnie Dumanis has directed SDPD to do ‘whatever it takes’ to dismantle any and all medical marijuana locations in the city. Last week, the medical marijuana community leaned the hard way about this new policy. On Thursday, November 7, several law abiding medical marijuana patients called the SDPD to report a broken window. Instead of launching a normal burglary investigation, when officers arrived on scene and realized the thieves were after medical marijuana, officers called in the Narcotics Task Force (NTF), Code Enforcement, the Sheriff’s Department, the DEA, and a locksmith to break into the building. 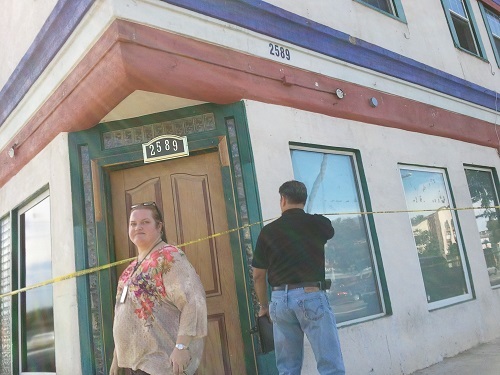 As soon as NTF arrived on scene, without warrants, and under the guise of conducting a burglary investigation, they broke down doors, seized medicine, records, and effectively shut down the legal, state sanctioned, medical marijuana dispensary located in the building with the broken window. The head SDPD Detective on scene boasted that he had single handedly shut down over 177 safe access locations and that this would be his 178th. Unfortunately, because of the misinformation provided by law enforcement, not a single local media outlet reported that the dispensary located at the location was properly incorporated with the Secretary of State, had paid their taxes, etc. The news also failed to report that two attorneys representing the collective quickly arrived on scene to assist the police with the burglary investigation and instead of being allowed to properly represent their clients were threatened with arrest for impeding if they did not immediately leave. Previously, medical marijuana patients were assured by local elected officials and law enforcement that calling the police in the case of a robbery or burglary was the right thing to do. No longer is that the case. In addition, at tonight’s meeting the group will be joined by Robert Brewer, candidate for San Diego County’s District Attorney, running against incumbent Bonnie Dumanis. Mr. Brewer will discuss his campaign and listen to concerns that patients, providers, and concerned citizens have, with the current reign and eradication efforts of Bonnie Dumanis.